The more thoroughly Donald Trump’s Russia connections are fleshed out and exposed, the more the Republican Party leaders have stepped up to either defend him or run interference for him. It’s led to questions about whether their actions are motivated by mere partisanship, or if there might be something more fundamental at play. To that end, a new report connects the financial dots between Russian money and Mitch McConnell, Scott Walker and other Republican leaders. The newly unearthed research has been produced by political pundit Scott Dworkin. This week he’s posted a treasure trove of documents tying various Republican Party leaders to campaign funding that’s coming from entities that appear to be close to the Russian government. 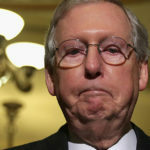 For instance he’s found that a Super PAC linked to Senate Majority Leader Mitch McConnell took $2.5 million from a pro-Kremlin oligarch in Ukraine during the most recent election (link). Dworkin has also determined that Wisconsin Governor Scott Walker took $1 million in similar fashion during the last election cycle (link) – and he’s publicly posted the relevant documents to support his assertions. He’s also tied Republican leaders including Ted Cruz, John McCain, and Marco Rubio to much smaller amounts of Russian money (link), suggesting Russia has been trying to cover its bases across the entire GOP. And so, even as everyone from the Senate Intelligence Committee to the FBI to newly appointed Special Counsel Robert Mueller digs in and attempts to determine why Donald Trump is so personally and politically loyal to Russia, and whether it’s due to a money trail, some of his most prominent allies in the Republican Party have already been confirmed to have taken money that’s come from Russia or its intermediaries. Follow Palmer Report on Facebook and Twitter.